Together with the Development Partner, hub South West Scotland Ltd, Dumfries Learning Town brings all the schools across Dumfries together to deliver education on a ‘whole town’ basis. The North West Campus is a new school in Lochside, Dumfries. The facility brings together Lochside Primary School, St Ninians Primary School, Maxwelltown High School and Langlands School. A single building incorporates all of the required facilities for nursery, primary and secondary education. The new facility also includes a sports hub including external pitches, redeveloped outdoor space, social space for community groups and a public library. 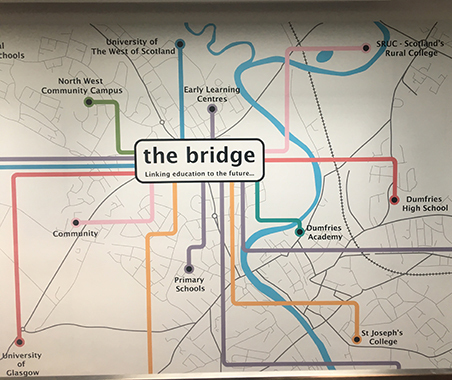 The Bridge will help people develop specialist skills and knowledge that they need for further education and work. The Bridge was built next to the King George V Sports Complex on Glasgow Road as part of the Dumfries Learning Town Project. The Bridge also includes a high specification recording studio, green room and live studio designed by RMP to BBC standards. The redevelopment of the Grade B-listed St Joseph’s College was part of the Dumfries Learning Town Project. The school on Craig’s Road in Dumfries has been transformed at a cost of around £24 million. RMP provided full design and acoustic services and worked closely with the project team to ensure that Dumfries Learning Town successfully met the requirements of BB93.